The EU’s General Data Protection Regulation (GDPR) will come into effect on 25 May 2018, and it will affect not only EU-based organizations, but many data controllers and processors outside the EU as well. Although preparation time seems ample, getting data processing activities in line with requirements will prove to be time-consuming, depending on an organization’s current maturity level. 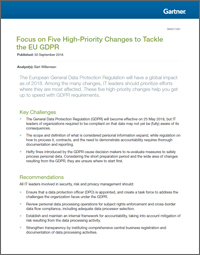 By the end of 2018, over 50% of companies affected by the GDPR will not be in full compliance with its requirements. Ensure your company is not one of them. We’re sorry, but this report is no longer licensed for distribution by Dataguise.